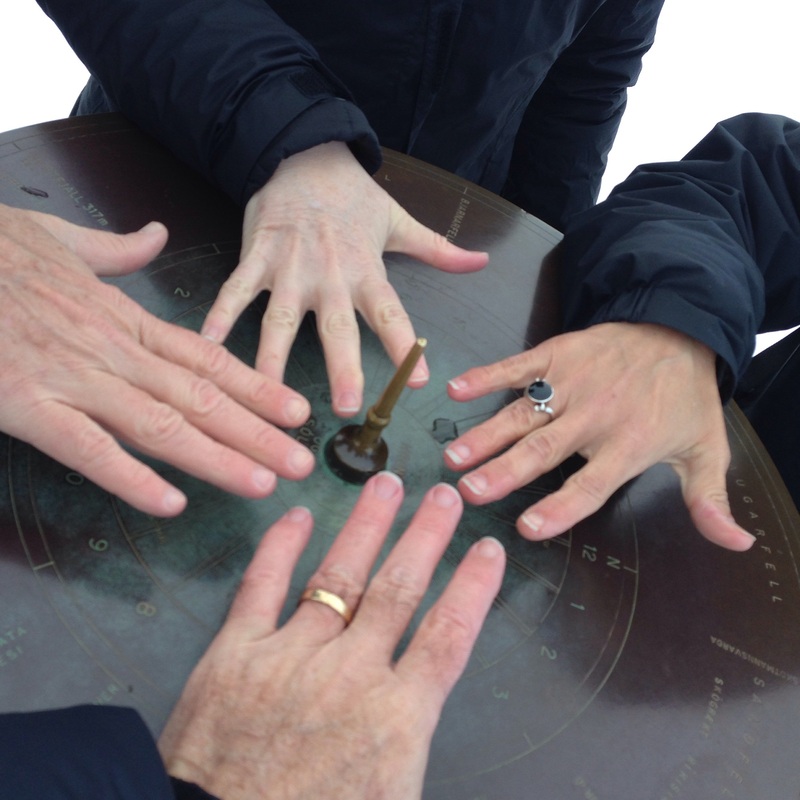 When last we left our intrepid travelers they had just finished slipping and sliding across a parking lot in Reykjavik, tattered map in hand, hail and wind gusts abounding. But day 2 they woke up bright and early to another Scandinavian/English breakfast to boldly embark on the next part of the great Nordic challenge, also known as the Golden Circle. It has a certain Wagnerian overtone – Ring series and all that. The Golden Circle has three main stops. 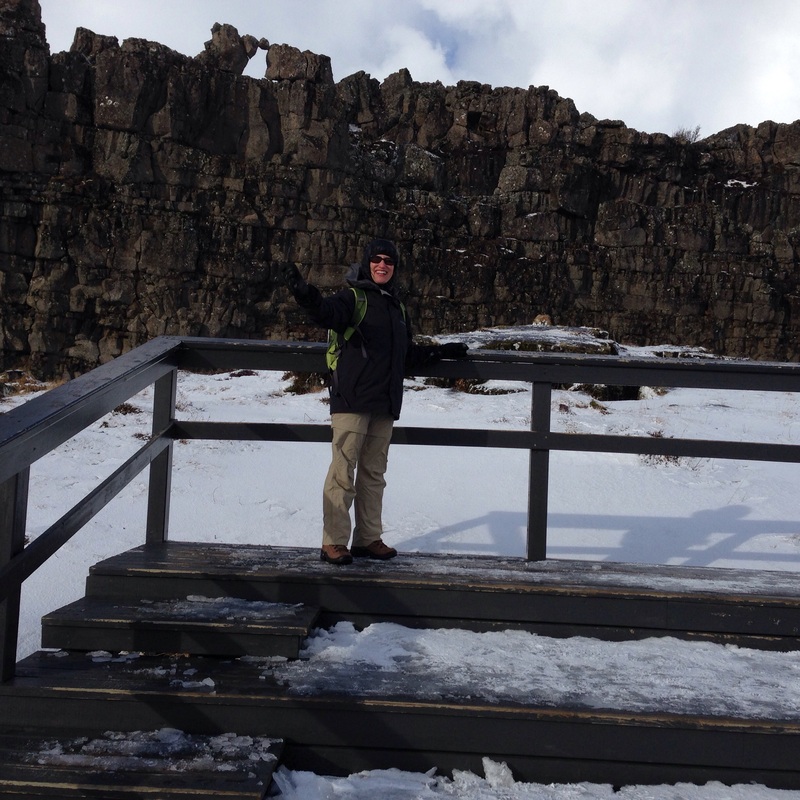 First is Pingvellir or Thingvellir (I don’t have Icelandic characters on my keyboard), the seat of Iceland’s Parliament starting in the 900s and, according to the signs, the oldest Parliament in the world. Unbeknownst to the ancients they had picked a valley located on the exact rift between the Euroasian and North American tectonic plates, which are pulling apart at the rate of a tenth of an inch a year – in geologic terms, the equivalent of a Daytona 500. You hike down the valley past such illustrious spots as the Drowning Pool and, my personal favorite, the Speaker of the Law Rock. Now if they would just put one of those in a courtroom…. After exploring the seat of ancient Icelandic government, the next stop was the geyser, Strokkur. 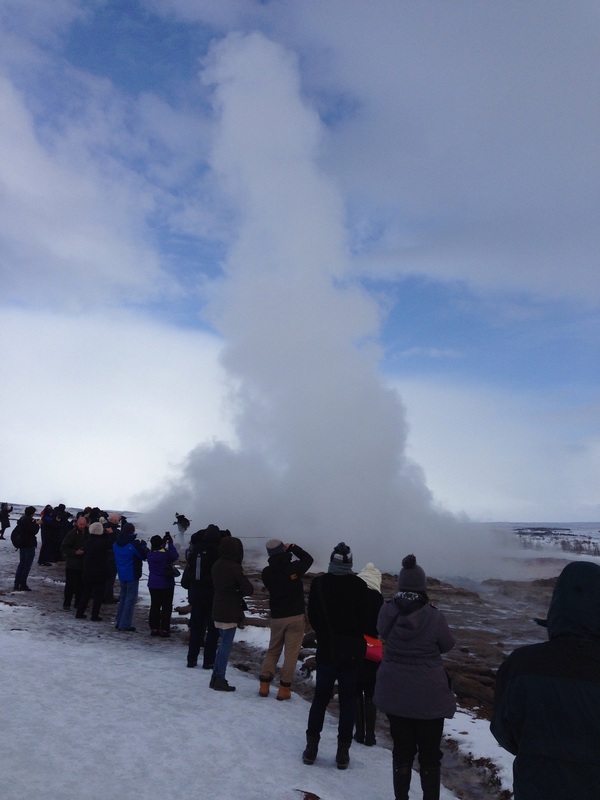 Unlike its larger cousin, the Geysir, it erupts every few minutes, so no one leaves disappointed. It wasn’t too crowded in early March, but must be a nightmare in high season. Mind you, through all this, husband J was bringing his Florida driving skills to bear through wind and rain and ice and snow. What friends M and S didn’t know until the last day was that he’d waived the collision damage insurance. Strokkur was dutifully impressive, shooting its 20 meter high spout with the regularity of a factory whistle. I personally found the little steam spouts percolating out of the side gullies and small bubbling puddles just as interesting. 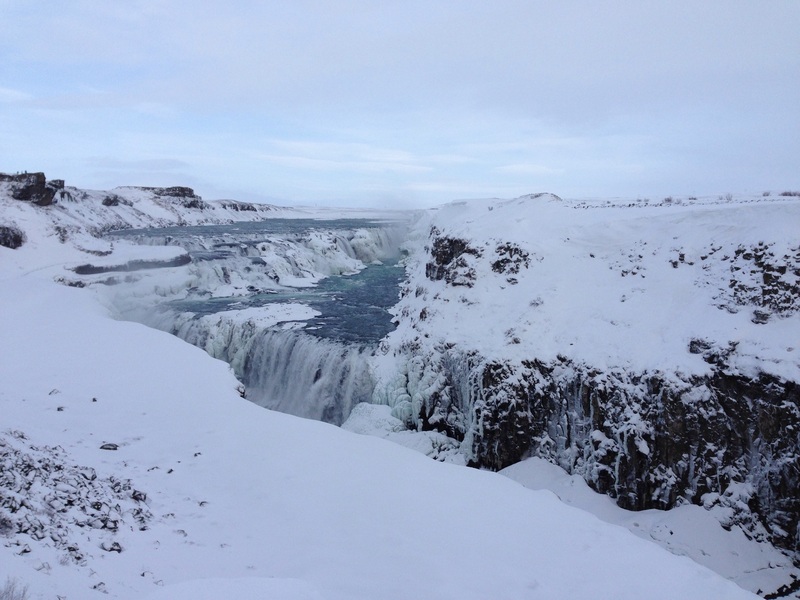 Continuing our tour – along with a few hundred people doing the exact same route – in fact, I started to recognize people from stop to stop – we journeyed onto the famous waterfall of Gulfoss. After encountering some quite bad weather on the way there, we didn’t even realize we’d arrived. You’re on a high plain, seemingly with no topography, and then an elaborate visitors center appears out of the middle of nowhere. We actually sent S out on a reconnaissance mission before we all ventured out to confirm there really was a waterfall in sight. It is an amazing confection of spray and rock and mist. Not quite as massive as Niagara Falls, it has two tiers and at that time of year, one side is frozen into sharp stilettos, contrasted with frozen rolls of ice that cascade down the side of the valley. The falls then flow around a bend and plunge into a narrow ravine that must be enormously deep. Aside from the falls themselves, Gulfoss has quite a remarkable gift shop. We had to convince S that he truly didn’t need to take a seal skin back to the United States. Ethical issues aside, the guide books are full of warnings of the dire consequences such attempts will result in at U.S. Customs. Of course, it is quite likely said seal skin really was produced in some quaint Icelandic greenhouse specializing in man made fur. More on the greenhouses later. But by then it was mid afternoon, and we felt it wise to get somewhere within striking distance of the Farmhotel where we were to spend the next two nights. As three of us are lawyers (well, M has relinquished the profession in favor of a more divine calling), we followed the “detailed itinerary” provided to the tee, arriving in the bustling metropolis of Fludir in late afternoon – but only after driving through a pounding snow storm on what became our new best friend of a road, I think numbered 341. Little did we know that Fludir would become our navigational tool for the remainder of our stay in the Iceland countryside. As a point of interest, Fludir has a population of 394. It is located in the unpronounceable municipality of Hrunamannahreppur in the Southern Region, Iceland. And the way we navigated, we ended up going toward, through and around Fludir for the next couple of days, since all roads seemed to lead to it. 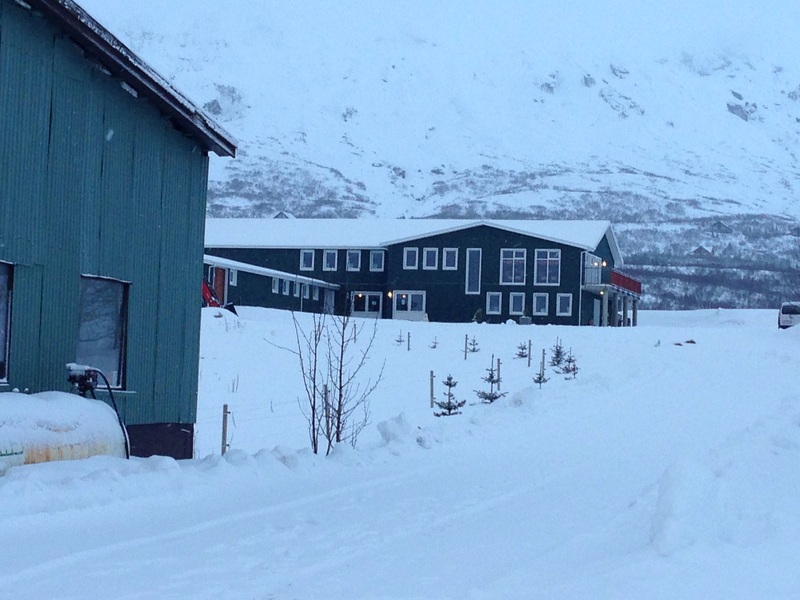 After quickly passing all of its few commercial establishments – including yet another of the ubiquitous Icelandair hotels, S finally broke down and went into the Fludir equivalent of a convenience store to ask where the Efstidalur Farmhotel was located. It was at that precise moment that J and I both had the same realization. 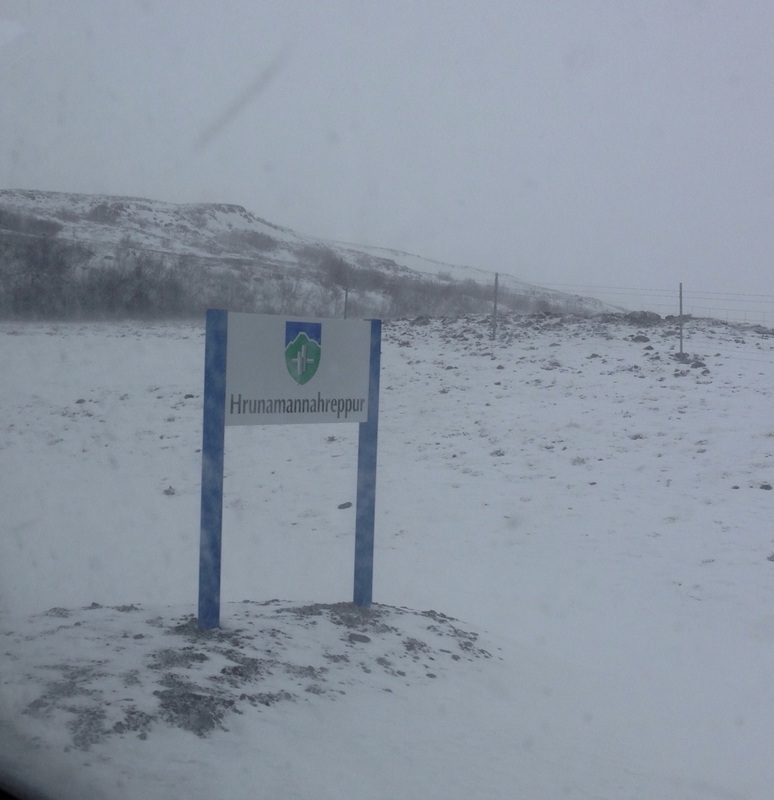 We had noticed some weeks before that the hotel we were booked at was not the hotel featured on the self drive tour company’s website, but was actually located in an even more remote spot, further east and away from Reykjavik. Oh. And the itinerary from the tour company, of course, presumed we were staying at the hotel people were normally booked at. Oh. So, J and I were not overwhelmingly surprised when S tromped out to announce that the hotel was not here but there and we had another half hour of fun driving in the snow before arrival. But the convenience store lady had given him a very detailed map which became our Bible for the next couple of days. Through more snow and sleet we went, eventually driving up a steep hill to an actual dairy farm. Cows all around, out buildings, and a small low building of ten rooms, five of which overlooked the wide white valley of fields below. We were home for the night.